Pest Control business owners know that their industry demands specialized pest control software. They cannot get away with “one software fits all” approach so common on today’s overcrowded app market. To meet the many demands of running a pest control business, management software for this industry needs to be both precise and flexible at the same time. At Thoughtful Systems, we’ve been providing scheduling and management software for the pest control industry for almost thirty years. Over the three decades of learning about the industry and incorporating feedback from our pest control clients, we’ve perfected a powerful and flexible software package customized for their unique business needs. Scheduling Manager for pest control businesses is a powerful integrated software package that includes job scheduling, workforce management, accounting, payroll and mapping features and will help you grow your business from startup through to large enterprise. Scheduling Manager is a breeze to learn and get started with. As you conitnue to use the software and gather more analytical data about your business, you can use the comprehensive reporting and business intelligence tools in Scheduling Manage to grow your company and offer the most profitable services. Every pest control business handles a variety of routine and specialized jobs, such as inspections, certifications, fumigations, etc., that require to be scheduled at different frequencies. Scheduling Manager for pest control business handles various frequencies for all these jobs, including weekly, once every two weeks, monthly, every few months, once a year, or any other customized frequency your company might need. Reminder e-mails can be sent at selected intervals after the last job was performed for a client and remind them that it’s time for an inspection or to take preventative steps. Scheduling Manager for pest control business efficiently keeps track of all extermination tasks specialized for various pests, such as cockroaches, termites, centipedes, lizards, rats, and many others. Easily record what pests are due to be targeted for each customer, location, and job. Also record what pests were actually successfully eliminated at each premise. Specialized reports available in the Scheduling Manager allow you to record and keep track of which pests are being targeted and what chemicals are being used at each job. 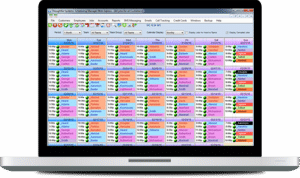 Scheduling Manager includes a complete list of 80,000 EPA chemicals for accurate tracking and recording. Having all the chemicals codes and information already pre-entered for you means you can start using Scheduling Manager right away without having to spend time on data entry. Scheduling Manager takes care of all required paperwork as the job is completed and produces a Pesticide Use report, customized for the specific requirements of your state. Take your pest control business mobile with our SM-Mobile App that works in conjunction with Scheduling Manager and is available on all Android and Apple devices. 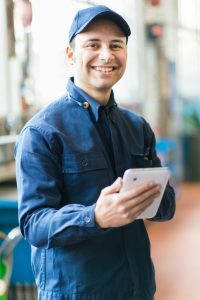 Your technicians can check their daily work schedule and see all client notes on their mobile devices. 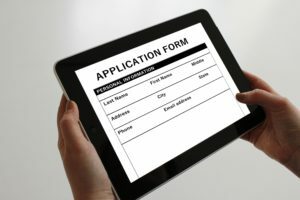 With SM-Mobile App, your employees also can take notes, record chemicals usage, complete jobs, and edit estimates and custom PDF forms right in the field to add additional line items or requests. In addition, each technician can take job-related photos, record client signatures, produce invoices, receive payments, and much more! You can record where your equipment is at any time with our Equipment Tracking Module. If you leave a fumigation tent or some blowing fans on site, you simply record it in the Equipment Module and set the length of time to leave it on site, then you will receive an automatic reminder for retrieval. You can also keep records of inventory parts used and maintenance performed on each piece of equipment, so you always know where your pest control assets are with the Equipment Tracking features. Create invoices automatically with our pest control business software’s integrated accounts receivable functions. The invoices are created when a job is completed, and you can immediately view each customer’s account balance information on your screen. You can quickly create sales, profitability, and aging reports and Scheduling Manager also interfaces with popular accounting packages such as QuickBooks, Sage, MYOB, and others. Sophisticated mapping tools available in Scheduling Manager allow you to optimize routes for every pest control technician based on their daily job schedule. Route Optimization greatly reduces time spent between jobs and money spent on gas mileage. This optimization features alone can save your pest control business more than the cost of the software! The GPS tracking feature allows you to track technicians so you can keep records of their arrival and departure times from the job site and the time they spent on the job. 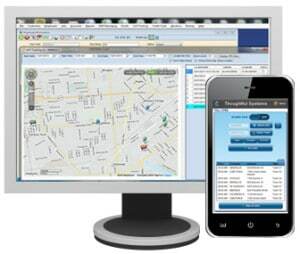 The GPS tracking feature in our SM-Mobile App records the location of each employee every few minutes. When an employee punches in to the job in the Mobile App, the time and GPS location is recorded. You can always verify the exact times your employees are actually on-site and maintain records useful for billing clients for all employees at their location for times shorter or longer than was specified for the job. At Thoughtful Systems, we know that some pest control businesses might require unique customizations to meet their specific needs, ranging from location and climatic conditions to the variety of pests to be targeted and pesticides to be kept track of throughout the year. Our Thoughtful Systems technical staff is always ready to listen and work with pest control clients to customize the Scheduling Manager software to their needs. When Innovative Pest Control in North Carolina requested a more efficient way to track their recurring clients, our Thoughtful Systems programming team worked closely with them to create a “Job Confirmation Calendar,” available right on their scheduling screen. 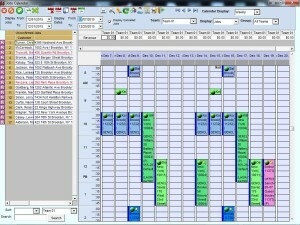 All customers who are due for a job for the present month are visible on the right side of the scheduling screen. Those jobs that still need a confirmation are highlighted in red, so you simply click the customer’s name and call them with a reminder or a confirmation right from the screen. The support and technical help that our business receives from Thoughtful Systems is above and beyond. Anytime we call them for assistance they are happy to help us…I would recommend Thoughtful Systems and the Scheduling Manager program to any business. If at first this system does not quite fit your needs just let the helpful people at Thoughtful Systems know and they will be happy to customize the program to your needs.